AL 3003 is an alloy with very good corrosion resistance and moderate strength. It is not heat treatable and develops strengthening from cold working only. 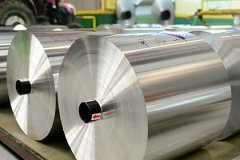 Main tempers for aluminum foil 3003 includes H 18, H22, H24 and other tempers upon request. This alloy provides a better heating and cooling environment so that widely used in household applications. Haomei Al. is a leading aluminum manufacturer mainly in business of 3003 household foil, container foil, packaging foil as well as electronic foil since 1997. Haomei Al. currently supplies 3003 aluminum foils from 0.01 to 0.20mm. Our plant equipped with flatness control system so that to ensure the precious of our foil. AL 3003 alloy is readily machined and is considered as having good machinability for the aluminum alloys. Typically, alloy 3003 is used in a number of industries. For instance, the Aluminum alloy 3003 is easily found in home appliances. From cooking utensils, bakery molds to office equipment it has many applications that you would find in your everyday lives.